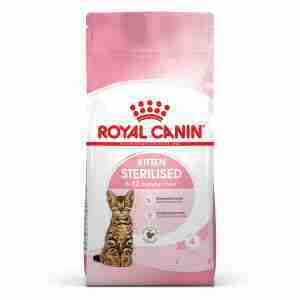 This Royal Canin food for sterilised kittens has been designed to give your neutered cat all the nutrition they need. As your kitten develops, they start to explore and it is important to remember that their immune system hasn’t completely developed. This food offers that extra support in the form of vitamins, minerals and a patented set of antioxidants to keep them healthy. Low in fat, the food helps to maintain your kitten’s weight as neutered kittens tend to eat more due to increased sleep and less movement. Royal Canin for sterilised kittens is highly digestible and the kibble is designed to be soft and small, perfect for developing kittens. We buy the 4kg bag every couple of months and pay only half the price we would at our vet. It's always delivered quickly. We use Pet Supermarket for all of our furry family members needs now. So convenient!